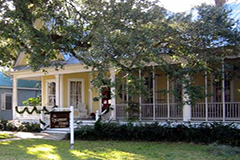 The Sycamore house occupies a National Register property overlooking historic Main Street in old town Bay St Lois. Originally a pair of 19th century Acadian cottages, the sides of The Sycamore House were combined into a single dwelling in the 1850’s. The home was long known as the Mauffray Boarding House after the Mauffray family who took in seasonal visitors. 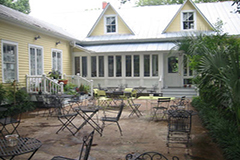 Today the cottage is home to a fully modern restaurant whose two dining rooms, screened porch and patio area, are in tune with its laid-back historic atmosphere. 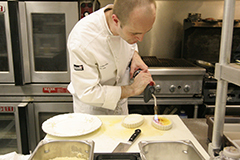 In the fall of 2002, Stella LeGardeur and Michael Eastham came to the Gulf Coast in search of a home and restaurant finding both in the former Mauffray boarding house. The traditional setting with its mature oak trees providing shade to the screened porch and patio area’s, had been a restaurant since the 1970’s, and the couple named The Sycamore House in honor of Michael’s grandmother whose British home of the same name was a source of inspiration and joy to him as a child. 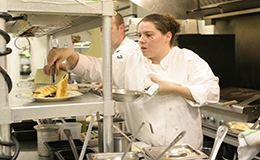 Stella and Michael both completed rigorous training at the Culinary Institute of America in Hyde Park New York. Both chefs apprenticed with people whose names carry weight in the world of food and wine - she with pastry master Dieter Schorner, both of them with Ric Orlando at New World Home Cooking - and both have since won recognition for their culinary skills, although the pleasure of welcoming guests to the home they’ve created at The Sycamore House eclipses and other achievement. They delight in sharing their love of food and extend a warm welcome to you their guests. Stella and Michael hope you will leave filled with the same delight that prompted them to name their restaurant after a home where wit, embracing hospitality, beauty and great meals were the norm.